this is the first drawing with my left hand, compare quality of drawing to writing! Practice What You Preach, is a good motto to live by: so soon after I broke my right wrist, I decided to start drawing with my left hand – as left or weaker hand drawing is one the basic exercises that I often employ when teaching drawing to a group of nervous beginners as it levels out the drawing ability of everyone. As you can see I decided to make linear observational drawings of the very thing that was ruling my life, the cast, sling and inert fingers of my right hand, also it would stay in position until I was finished. The first drawing took more than an hour to complete – a really long time for an A4 page of black and white line work. I used a propelling pencil, the first thing to hand, so the range of marks was restricted – but this turned out to be a useful restriction. 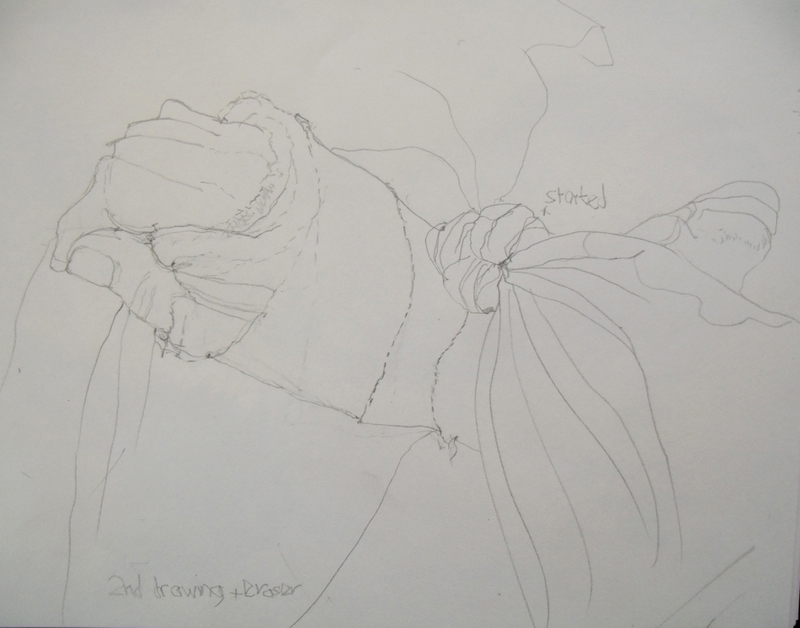 This first drawing has all the hallmarks of a weak drawing having been revised – I decided to make a continual line drawing, ie not taking my hands off the page as I seemed to have lost the innate sense of proportion enjoyed with my right hand, I couldn’t trust my judgement of angles and distances between the elements of the hand and arm. When I had finished the first lower drawing it looked really weak and wobbly and lost on the page, so I filled in the background of the scarf – this took a lot of time, my left hand has no strength and the shading looked scribbled instead of nuanced to describe the density of the fabric and the contours of the folds. Then I drew a line drawing of the first drawing, I was surprised that these clumsy drawings do sill look like my work…drawing is like handwriting. The second drawing appears simpler because I had more confidence after drawing for an hour and I used an eraser as a drawing tool – a very blunt instrument in my left hand. Still keeping the continuous line as a discipline this study suffers from overdrawing – a thing I absolutely hate in anyone’s drawing . The second firmer line that covers the first attempt is invariably clumsy and the drawing looks stilted ( see fingers); better a light wispy drawing than a second deader line. But even the writing is a bit more controlled. I also began to change the way of describing the fabrics, the dotted lines are my version of the crepe bandage. 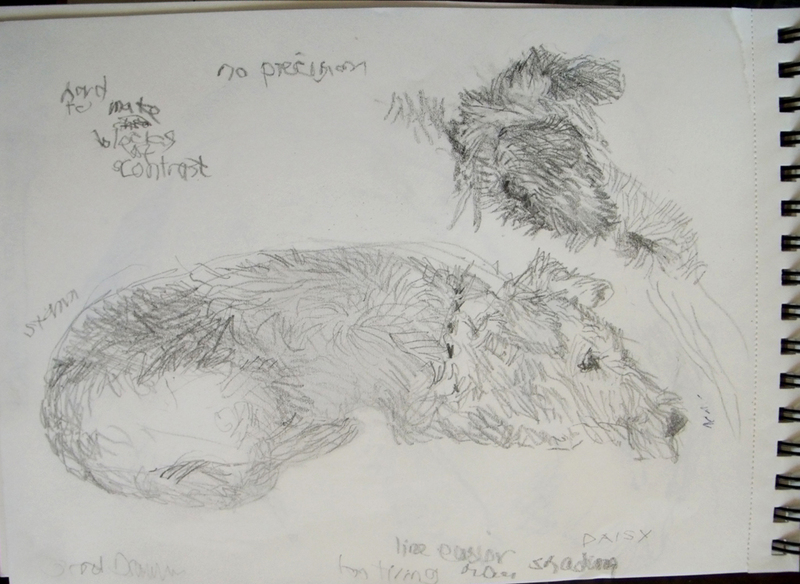 my third drawing – sleeping terriers. Deciding on making descriptive pencil marks rather than the continuous line drawings, the next day I embarked on drawing my dogs. I was confined to the sitting room to keep my arm still and propped above my heart to try to alleviate the bruising, and they had taken to settling down in front of the fire where they snoozed all day, although they often just got up and walked away mid drawing. 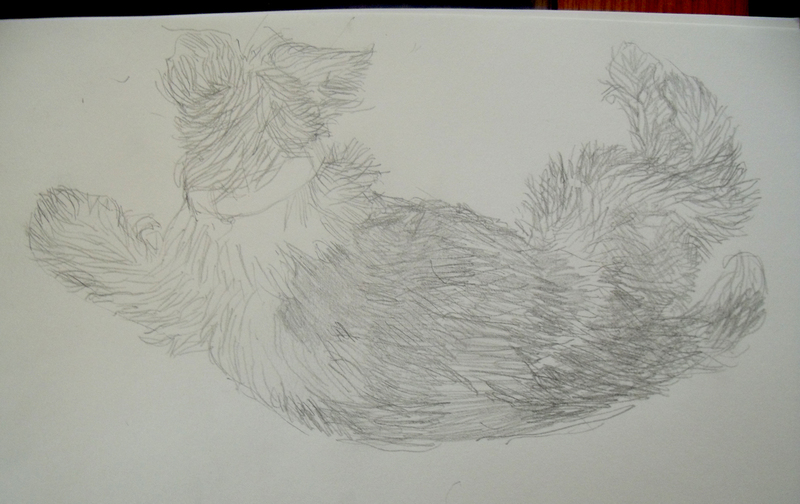 The full length sleeping dog drawing above looks exactly like my dog Daisy, but not at all like my usual drawings. I have written frustrated comments around the page – “line easier than shading” but I was finding that shading with a softer drawing pencil meant that I had very little control of the angle of the point – it was like drawing while looking in a mirror. The lines are fuzzy with the pencil lead wearing down quickly as I worked, I was unable to manipulate a sharpener – let alone a knife. The surface is getting rubbed with my left arm as I work and looks really lifeless.When using pencils I rely on the range of different tones available from even an HB pencil – but they rely on pressure to make them. Reverting to the propelling pencil I attempted to make a more linear study of the dog’s fur; the way it grows is one the most interesting things to draw. I tried to add shading to the line without resorting to smudging and rubbing to get darker marks, but my left hand does not have the strength of my right to press down for a blacker thicker line. Again this drawing seems clumsy because of how I chose to make my marks I simply can’t use many of the refined marks available with my right hand. I reverted to my line drawings – they made me feel better! my reversion to line drawing for Boysie’s head. Now this really started me thinking about how I relate to my drawings, they aren’t just a useful tool to free the ideas in my head – although this is their most useful service to me; they actually explain the world I see to me and to everyone else who cares to look – they are the most direct and personal extension of me. I have spent a long time (way over the 10,000 hours required to make a craft skill second nature to the maker) developing a fluent style of drawing, almost shorthand, that enables me to both understand what I see and/or imagine. Look at my drawings and you will see who else I am – beyond the person in front of you – and they are how I want to be seen. Heck! 2 weeks on and I have started drawing the dogs again. My right hand, still in the cast, has some movement but it is too painful to use often. 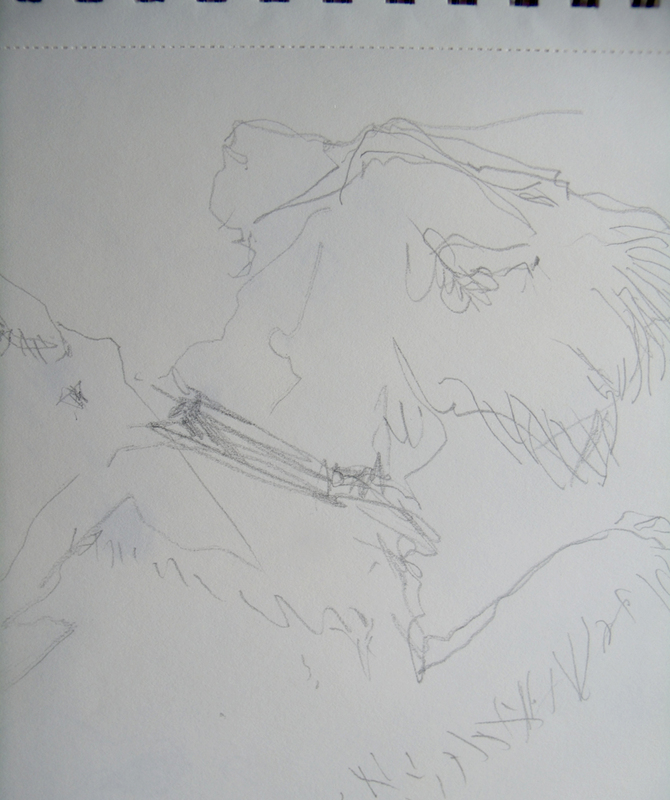 The drawing of the sleeping terrier above is a fair portrait of Boysie and also my line has become more descriptive. I am learning to make smaller studies, not expect too much – must remember to deal with details when teaching beginners. Although these drawings are still very clumsy to my mind and painfully slow to make – they are of my scraggy terriers and friends can recognise them individually. The sleeping dogs above were both started with my right hand, I mapped out the whole area to be drawn first using my right hand, you can just see the outline. 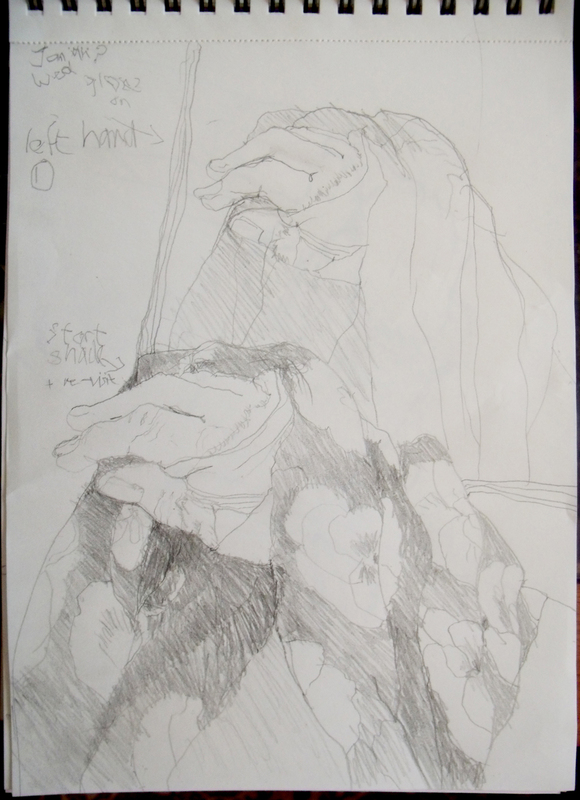 Now whether my belief in the outline made me feel more secure to use my left hand to work the details or whether using my left hand for the last month has given me more control I do not know – but these are drawings that do not look like they are made with the weaker hand. 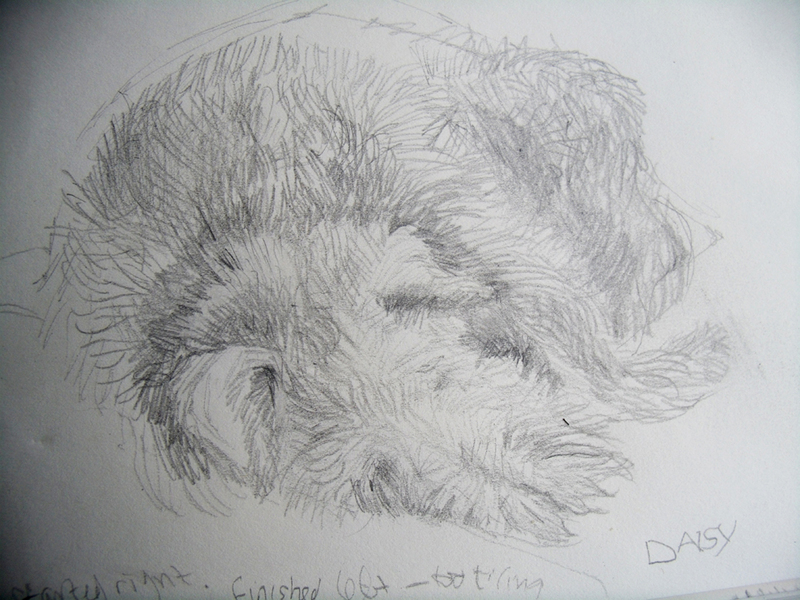 But just so that you can see the model that I worked from, enabling you to judge if I am back to my fluent line – here is Daisy still asleep long after I had finished the study above. There are all sorts of things written about drawing with your weaker hand – you are more in touch with your inner being, using the opposite side of the brain unearths alternative visions etc. All I have to say is that it is very slow, very demoralising to begin with and completely exhausting – just like learning to draw with your strong hand! 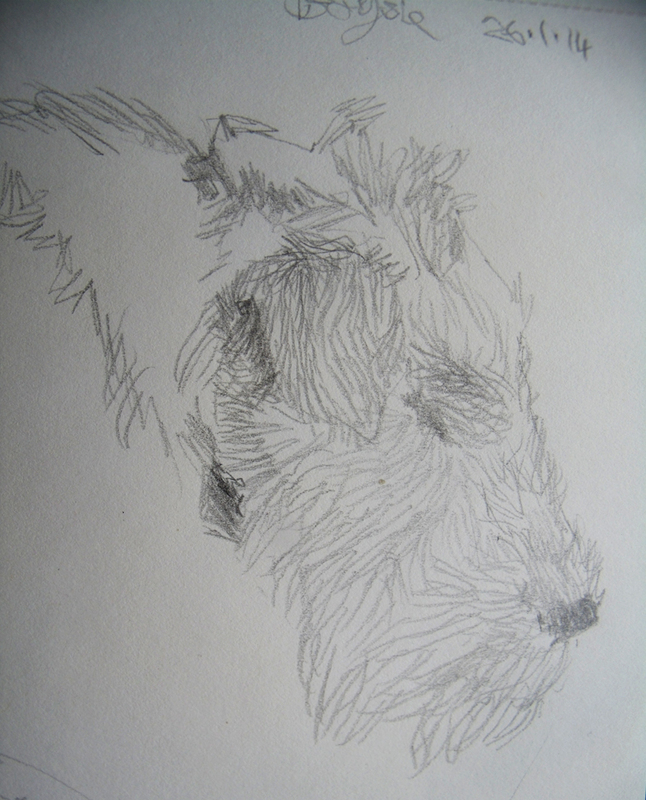 Categories: Drawing | Tags: Fox Terriers, left hand drawing. s, line darwings, pencil drawings | Permalink. well done! 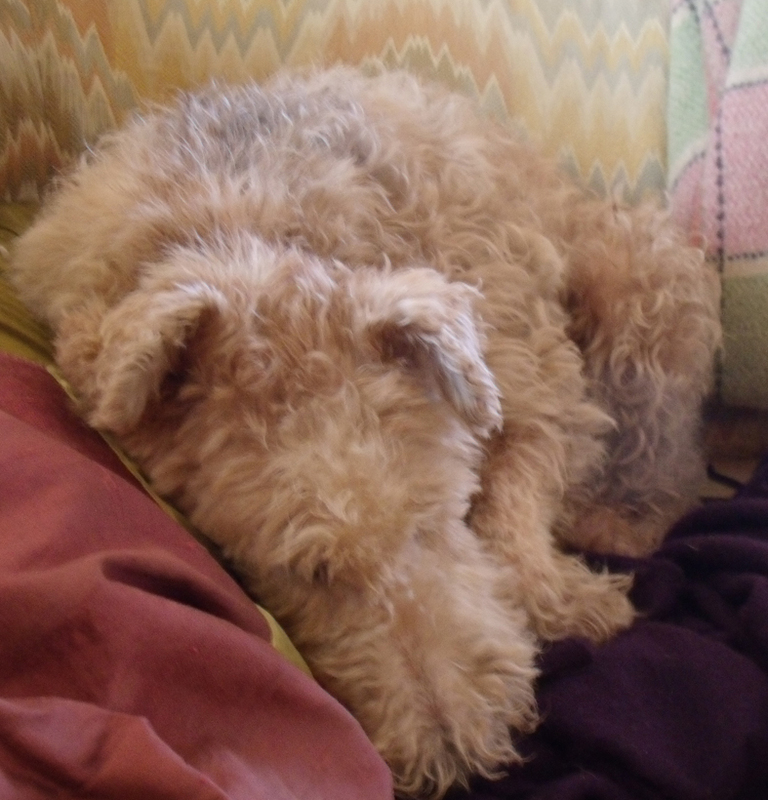 Daisy looks just like my dog, is she a Lakeland terrier? Thank you for the inspiration, I hope your wrist mends soon. Full of admiration – I love you dog drawings – I broke my right arm once – my left had writing was impossible to read and I know I could never have drawn anything. Also, I found it almost impossible to slice a loaf of bread (ended up holding it with my feet – specially washed for the occasion) ….. I do admire your beautiful left hand work . Thanks Helen for this comment, I have 2 weeks to go before the cast comes off and I am so looking forward to it. About using a knife – forget it – I think you were either very brave, very foolhardy or just very hungry to attempt using your toes when cutting bread – at least a pencil do too much damage. but doing the drawings has restored some confidence in me and coupled with all the extra time I am having to take off from running my business, I am starting to think about new work for my “ongoing Work project…it’s an ill wind!